"Give the customers what they want. What's the measure of a well designed barge? Listen to the people who design them to meet the customer's needs. Malek: "Some of our competitors offer options. But we know that giving our customers the barge they want means more than offering a limited list of options. "Our customers can specify any applicable modifications. Such as: plating in a variety of gages, angles, cuts and shapes not pos- sible with 'one-way' construction; temperature control systems; linings, coatings and insulations; electrical or mechanical power sources, pumping and piping sys- tems. Even special welding for cer- tain applications. "Our design experience, knowledge of materials and acces- sories, and our construction flexibil- ity let us build a quality barge, to customer specs, delivered on-time, all at a competitive price. This com- bination has kept our customers coming back." Carl Malek can design your next barge, too. 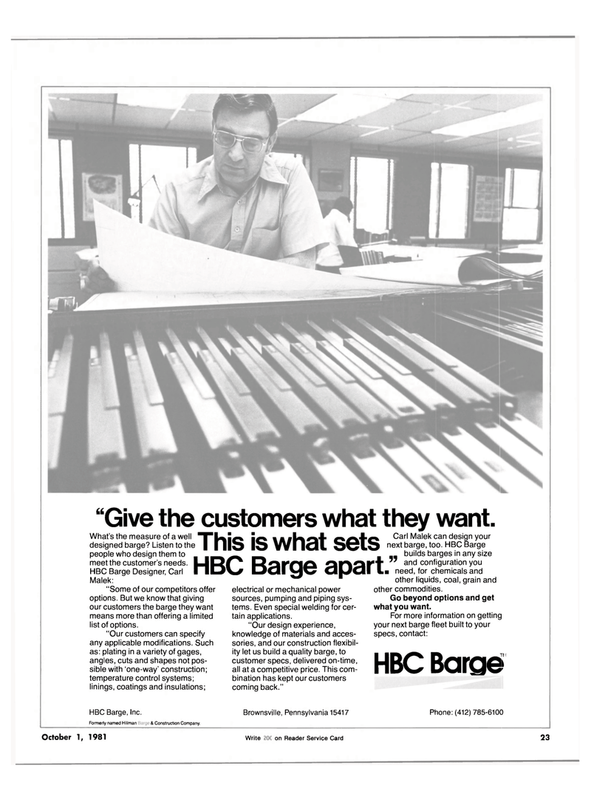 HBC Barge builds barges in any size and configuration you need, for chemicals and other liquids, coal, grain and other commodities. Go beyond options and get what you want. Formerly named Hillmart & Construction Company.